Development of the Russian helicopter, the Kamov Ka-31 (NATO Designation: 'Helix-B'), began in 1985; production started in 1998. 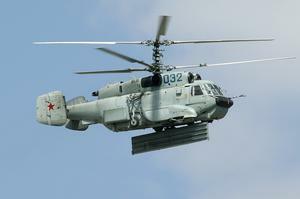 Formerly known as the Ka-29RLD, a variant of the Ka-29, the airframe design is based on the Kamov Ka-27. Equipped with Real Time Kinematic (RTK) surveillance radar equipment, the helicopter is designed to monitor air and sea spaces. The aircraft radar is within operating range at heights of 1500–3500 meters and can be transmitted to more than 150 km; the antenna panel spans 6 meters and rotates with a scan interval of 10 seconds. Resources related to the Ka-31 , provided by the Vertical Flight Society. Resources related to the Ka-31 , provided by public sources across the internet.